1. Kidkusion Corner Cushions: We used these on the corners of our coffee table to keep Liam from hurting his head as he took those first wobbly steps. They are somewhat inconspicuous on our dark coffee table and are easily removed when you no longer need them. They haven't left any marks on our table either, which I am pleasantly surprised by. 2. Bundle Monster Door Stops: These are just adorable; I especially love the pig! We use these on doors that need to be left open, i.e. the door to the basement & to the laundry room which is where we keep the litter box. If you find that you have a little door-slammer in the family, they are great to keep them from making a racket and pinching their fingers. 3. Safety First Magnetic Locking System: This has been by far one of our best purchases and so worth the extra money over the cheaper cabinet door locks! You install these locks on the inside of your cabinets and use a magnetic key on the outside of the door to open them! Pure genius! The best part, is that you can turn them off by a small switch on the lock. Since Liam can't even make the cabinet doors budge with these installed, he quickly lost interest in trying to break in and throw pans all over the kitchen! Although, he does occasionally give them a tug, perhaps just hoping to find one unlocked. We installed these on all our lower cabinets in the kitchen & bathroom and haven't been annoyed by needing to use a key at all. It did take a little get used to for us, but is now second nature. I highly recommend this system! 4. Munchkin Easy Close Baby Gate: We chose this baby gate for the top of our stairs knowing that we wanted a barrier with a swinging gate that you actually install into the wall for ease of access & safety. Since our stairwell is wide, we ended up needing the extension. It's really easy to open with one hand, even when I'm holding a load of laundry AND a baby while still being very secure for Liam. 5. Safety First Wide Doorways Fabric Gate: We chose this pressure gate for the archway from our kitchen to the entry hall. We placed it high enough for Charlie (our cat) to be able to sneak under, but low enough so that Conor & I could easily climb over it. We would often take down this gate when we had company over; once adjusted, it is very easy to put up and take down as needed. We no longer need a gate in this area for Liam, so I'm happy we used one here that was temporary. I can only handle so many holes in my walls! 6. IKEA Shelf Unit: This is where we store our TV & internet consoles, and it has worked out perfectly for us. We put one of the magnetic locks on the door so Liam can't open it, and since it has glass doors, our remotes have no trouble. Conor modified it a bit with holes in the back to run cables and some ventilation. This has been the perfect solution to keep our little button pusher away from these electronics! have yet to baby proof the house! 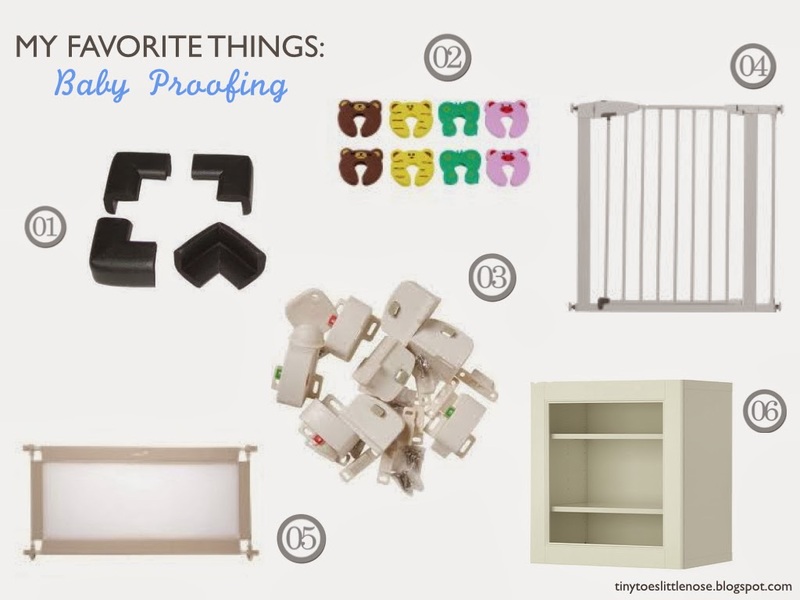 My next "favorite things"
will be our month 15 &16 favorites. Send me all your suggestions!!! The magnetic locking system seem genius! If the cabinets don't budge, then little fingers can't get pinched either! We have the the ones that you open slightly, then push down to open all the way. My youngest has been way more curious than my oldest was. We had to put them on most of our cabinet doors. I am going to have to check out these magnet ones! I did not know about the magnetic locking system. Our first baby is due in 5 weeks so that will definitely come in handy in a few months. Thanks for sharing your tips! This is the perfect post for me right now! We are in the beginning stages of baby proofing. We've read great reviews about the magnet cabinet locks and already bought them. We will be installing them this weekend. I am so glad to see good reviews of them again in this post. Oh no! At least you are prepared for any future lock outs!